When identical twin Brenton Gurney, 38, spoke to me about having a premonitions when his brother was in a life threatening situation, I did not think much of it. Brenton had come to our brain research lab to undergo a series of psychological and cognitive tests including EEG and MRI. While I was setting up his EEG cap, Brenton informed me that he was glad to get an MRI as he was experiencing recurring headaches and wished to get to the bottom of the matter. We examined his MRI report and found no structural abnormalities. However, Brenton was not imagining headaches, the MRI scan of his twin brother Craig revealed a 4.2-centimetre brain tumour. The scary thing about intuition is realising it when it’s too late. After a 10 and half hour surgery, Craig has made a full recovery. I studied neuroscience to reverse engineer explanations for what I inherently knew. However, I was in an industry that did little to talk about the elephant in the room because their jobs depended on it. It was easier to say that “more research needed to be done” than fund investigations for what makes our reality nonsensical. I decided to take a leap of faith, abandon neuroimaging research for the newly emerging field of neurotechnology. I began working for a large hedge fund developing brain training tools for people who work in the stock market. 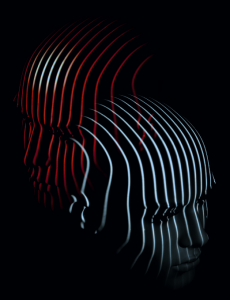 The boundaries between reward and fear is dangerously blurry for stock traders whose brain networks are intrinsically linked to their survival drives. The prevalent understanding of cognitive neuroscience considers the brain to be similar to bayesian probabilistic mapping. Our self-generated thought trials constantly updates each time there is a mismatch with reality. The cerebellum; known to have more neurons than the entire nervous system combined, is responsible for holding the efferent and afferent reality and identifying any mismatches in realtime. This form of thinking is referred to as explicit thinking. Our linear thought iterations are cognitively heavy and slow down our ability to respond in realtime (Dietrich, 2004). The brain training technology I was developing was only adding to this cognitive load. It was becoming increasingly apparent to me that some of the best traders made spontaneous decisions that were seemingly irrational. What was surprising was that their decisions were more informed in retrospect than what we can consciously process in realtime. I once again felt like I was in the wrong industry and inherently knew that there was something deeper going on. The starting point of my investigation was to identify the limitations of the brain. Processing speed — the brain is wired for cost-efficiency and has a latent lag of 200ms before stimuli enters our conscious perception. We are therefor 200ms behind the present moment. Working memory — our working memory is context dependent and is the amount of information we can hold in our brain in real-time. Attention — is our ability to filter our unnecessary noise and direct our focus. A user friendly guide to the nervous system. These limitations did little to explain how the best stock traders come up with spontaneous solutions, often without their own volition or how Brenton had a premonition that his brother was in a life threatening situation. My investigation was leading me to an entirely new way of thinking about the human brain. According to Smith , information is processed in a hierarchical manner which is termed neurovisceral integration. This multilayered process is by no means linear with iterative loops interacting in each cycle of the process. Level 1. Cardiac pulmonary response — regulates blood pressure and heart rate. Level 2. Cardiac endocrine — interaction with adrenals, thyroid and other endocrine organs to alter our basal metabolic rate. This is the first instance where fight or flight mode is triggered. Level 3. Cardiac visceral — interaction with the autonomic nervous system, digestion, respiration, immune function to redistribute metabolic energy depending on the sympathetic or parasympathetic state. Level 4. Subconscious and sensory motor integration — involves reflex arcs for example, reflexively removing our hand from a hotplate even before we have felt the pain. Level 5. Subconscious integration — the hypothalamic-pituitary-adrenal axis. The hypothalamus is considered the relay station between the conscious and subconscious. Level 6. Highly processed subconscious information enters our conscious perception. Level 7. The Default Mode Network (DMN) — The recursive thought patterns that make up the background activity of our minds. Level 8. Integration of time parameters — such as memory with emotion, projection of past and future scenarios and prioritisation of goal directed behaviours. The age old concept of the central nervous system (CNS) as the control centre for the autonomic nervous system (ANS) is being challenged by the emerging insights from neurovisceral integration. We may have far more control over the ANS (processes that occur below level 7) than previously thought. In the Nijmegen Institute for Infection Diseases (NIID), 12 healthy volunteers were injected with an experimental endotoxin (Escherichia coli). Under normal circumstances, the bacteria would cause severe flu-like symptoms (abdominal cramping, diarrhea, vomiting, fatigue) for the next 3hrs. However, in this particular trial, none of the 12 subjects show any of these symptoms. Instead, the researchers find a voluntary activation of the sympathetic nervous system with excessive release of epinephrine and suppression of the innate immune response (Kox, M., et al. 2014). The volitional suppression of immune function sustained the body in a natural homeostatic balance. The nervous system is lightning fast and can localise invasion or injury before a nascent response. This happens before the immune system gets a chance to mobilise — through a slow, distributed, non-integrated and dose dependent process. The nervous system is integrated and highly efficient, yet unlike electrical hardware it is also organic and self organising. 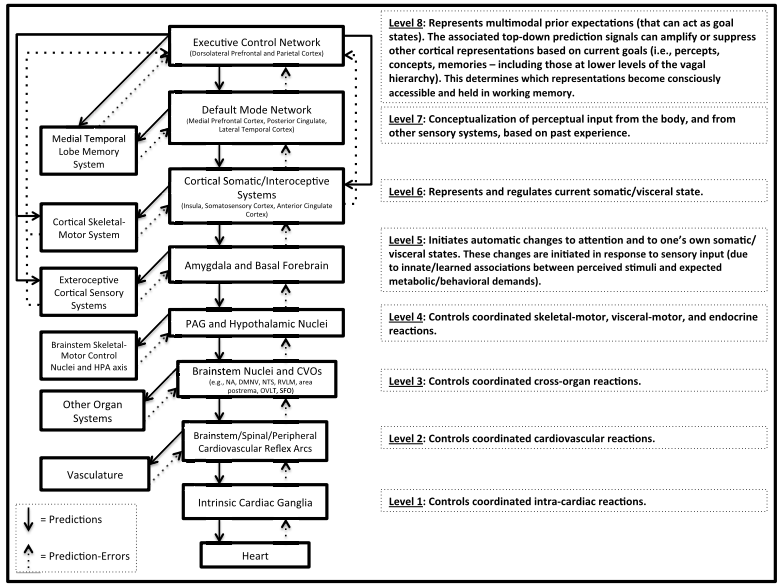 While our explicit thought processes are limited to levels 7–8, the default mode network and above, much of the nonlinear pathways exist implicitly in the subconscious and downstream regulation of the heart. The heart is modulated by the activity of the vagus nerve — the 10th cranial nerve, descending from the brainstem and is responsible for the coordination of organ systems such as respiration, digestion and immune function — bodily functions we consider to be autonomic. Most notably, it is the vagus nerve that determines the internal state of the body. The vagus nerve is the break mechanism that recovers the body from the sympathetic fight or flight mode to the soothing rest and restorative parasympathetic state. The parasympathetic activity is the conduit for our internal state of harmony — homeostasis, feeding and sexual arousal. What is challenging our scientific foundation is that 90% of the information traveling in the vagus nerve are afferents — going up to the brain (McCraty et. al 2014). It is the body that is regulating the Central Nervous System (CNS) rather than the CNS being responsible for our Autonomic Nervous System (ANS). The communication between brain and body, between the CNS and the ANS is known as vagal tone and can be measured using biofeedback devices and in recent years, through wearable technology that measure Heart Rate Variability (HRV). High vagal tone has been shown to provide physical rewards such as regulating blood glucose and suppressing inflammation, both of which are risk factors for cardiovascular diseases. The mental benefits include, the use of vagus stimulation for the treatment of depression, chronic fatigue syndrome and in predicting treatment response to medication and healthcare interventions (Young, 2013). Only recently have researchers started to support the importance of parasympathetic function in determining higher cognitive function. A recent paper by Forman-Alberti, challenges the computational understanding of neuroscience where the iterative loops of the brain predicts errors between the internal representation of the world and the external reality. The Bayesian probabilistic approach is at the heart of most learning algorithms in neuroscience and machine learning. What Forman-Alberti’s group has shown is that our autonomic nervous system responds to patterns of stimuli before we are consciously aware of them. This gives rise to intuitions or “gut feelings” about situations and behaviours. The research stands to reason that this implicit intelligence assists in learning and is an integral part of decision making under uncertainty. Rather than Bayesian probabilistic thought trials, the nonlinear iterative loops give a quantum computing representation — a knowing that we cannot comprehend. 1. Errorless — the heuristic learning approach to learning where multiple pathways to an outcome are streamlined over time. This discovery based approach is play-like and concepts of failure have little relevance. 2. Analogy or skill transfer — Learning through and unrelated activity. For example, music helps in learning foreign languages and social empathy because we become sensitive to tones and annotations. 3.Cognitive Stacking — learning where we pay deliberate attention to a secondary task to learn a primary task. For example, when learning to juggle, we pay attention to peripheral vision rather than focus on the juggling balls. In this manner we learn to “see” with our hands and “feel” with our eyes. Implicit intelligence is cognitively stable because it’s independent of context (Analogy), robust to stress (Cognitive stacking) and inherently enjoyable (Errorless learning). So far, our brain training and learning protocols have been concentrated in explicit forms of intelligence. The time based processing is often too slow for moment to moment cognitive flexibility. Implicit intelligence is indicative of adaptive attentional and regulatory processes that is not limited by our cognitive thresholds (see Box 4). My interest in brain training, was shifting from unilateral cognition to subconscious iterative loops. Integration of information can happen in three iterative cycles. The first cycle, integrates the ANS and CNS. The brain-body coherence is associated with high vagal tone and an internal homeostatic harmony. The second cycle of integrates, the implicit and explicit intelligence. The “chunks” of subconscious information contained in levels 1–6 (see Box 2) allow individuals to discern patterns in the data and to make use of those subliminal patterns to inform future decisions. Some may call this insights, epiphanies, creativity, intuition or gut feelings. The third cycle is the bayesian probabilistic learning that provides ongoing updates of our internal representation based on our experience with the external reality. The bayesian thinking is active when the the nervous system is in fear and this is precisely what works poorly under uncertainty. However, the great paradox is that some of our best ideas come to us when we least expect. Taking a walk, not only takes our minds off the problem, but allows the nervous system to briefly relax into a parasympathetic state that restores homeostasis to the body. The lack of internal threat signals shifts our thinking from bayesian strategic thought trails to one that is imaginative. It is when we are feeling safe that we have the confidence to be most creative and this is precisely what works best under uncertainty. This explained why some of the best stock traders were able to come up with spontaneous decisions that were far more informed in retrospect. Box 4. The subconscious acts beyond our cognitive thresholds. We may not have an explanation for Brenton’s sensitivity to his brother’s tumour. Yet, our emerging understanding of vagal tone and the communication between brain and body is providing the first hints. When our nervous system is relaxed there is high congruence between brain and body and we may able to read visceral patterns which registers in our subconscious but in that moment may not make sense to our minds. The scary thing about intuition is realising it too late. We are only now discovering the intelligence of levels 1–6 of information processing. Perhaps when our minds are relaxed, the background activity of the mind and strategic thought trials subside to reveal deeper layers of the subconscious — a knowing that we cannot comprehend.